Our most favourite range of TORR TOYS Glass Hoppers is the Mazzer grinder glass for coffee grinders. It´s not only about the grinders itself but we can find a similar Design of grinders here, different sizes and a big quantity of models, all of them in excellent quality. It´s really a pleasure to mix different Mazzer grinders in one location with different glasses and Glass Hoppers. For the Mazzer grinder glass, we offer 3 different adapters and all sizes: 300, 600, 1300. If you don´t care about the classic OEM design of your grinder, or if you need to reduce the size of your grinder for any reason, all glass sizes are possible for each grinder. So it´s possible to use a 300 size glass for a Mazzer Royal or Robur (old model available so far) as well as to use a 1300 glass for the Mazzer Super Jolly if you like it or need it in a high volume coffee bar as a professional barista. Actually, we modified the S2 and S3 adapter to make it more sleek and elegant. This is possible with our stainless steel construction compared to the OEM plastic parts. 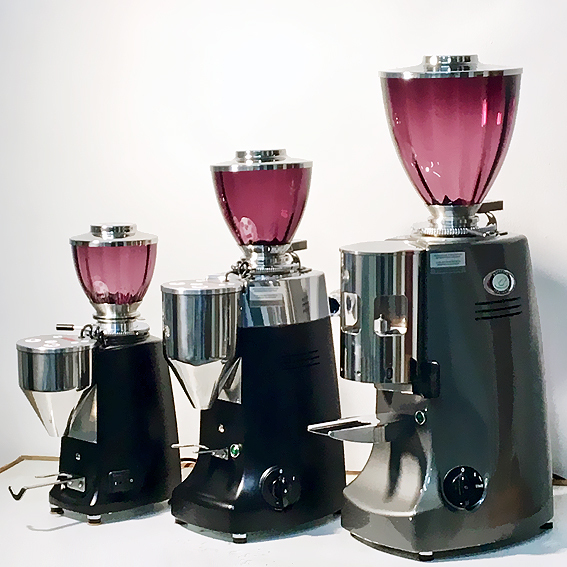 As the Mazzer grinders are available in good quantities worldwide and as a result of the higher demand of Glass Hoppers here, we are going to expand the Mazzer adapter models concerning the finish and colours to match each and every need from glossy and matte stainless steel to black coated, DLC and many more. The most complicated adapters so far are the Mazzer S2 and Mazzer S3 ones which have an extra tube to release the electronics. They will fit the Kony and ZM (MAZ S2) and the Robur, Royal and Major (MAZ S3). The prices are higher than the MK ones, both are CAT C.